With a premier location in Perimeter Center, the Marriott Atlanta Perimeter Center Hotel provides travelers with unparalleled service and Southern comforts. This modern hotel in Dunwoody, GA, features a vibrant Greatroom, where guests can gather in flexible work spaces. For those looking to explore, our Atlanta Perimeter hotel is adjacent to the new State Farm Atlanta Campus and minutes away from Cox Enterprises, fine dining, world class shopping at Perimeter Mall and 15 minutes from downtown via MARTA. Unwind in one of 341 spacious rooms, featuring wireless Internet access. This classic Perimeter hotel in Atlanta, GA, offers exciting amenities including a fitness center and a stylish ''day and night bar'', serving savory regional cuisine that transitions from morning to evening. Guests can take advantage of more than 18,000 sq. ft. of revitalized meeting space for innovative gatherings and social events. 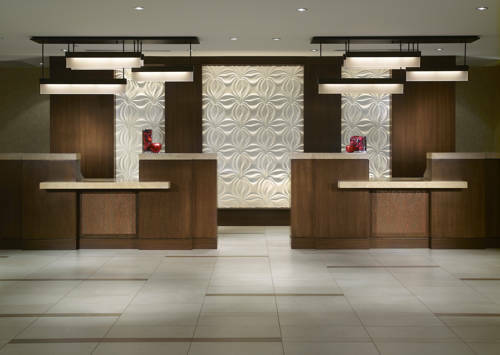 Experience a favorite among Dunwoody/Atlanta hotels at Marriott Perimeter Center. Wake up to a hot southern meal and choose from a scrumptious breakfast buffet or an appetizing a la cart menu at one of the best restaurants in Dunwoody. Start your morning off right at Marriott s Twisted Oak. Enjoy a delicious cup of your favorite gourmet Starbucks coffee such as caramel macchiato, vanilla latte or caff mocha while picking up a light breakfast item in The Greatroom, our Dunwoody, Georgia restaurant.